The announcement comes on the same day Springsteen releases the first single from the album "We Take Care Of Our Own." Let's talk about what we know about this record. With the release of "We Take Care," Springsteen fans have now heard three of the 11 tracks from this record, in some fashion. "Land Of Hopes and Dreams" was a new song played every night of the E Street Band reunion tour at the beginning of the decade. The live version of "Land" was was released on the New York City live album and also appeared on Essential Bruce Springsteen. This is its first release as a studio recording. 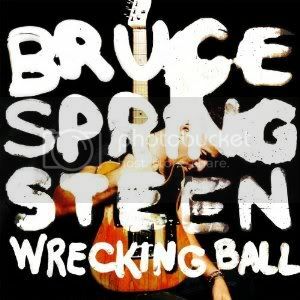 "Wrecking Ball" was played on the final leg of the Working On A Dream tour. A live version of it from Giants Statdium can still be purchased from iTunes. It was partly inspired by the demolition of the old stadium which has been replaced by a newer version. It meant enough to Springsteen to continue playing it beyond the Jersey homestand and it's now the title track of this new record. For those of you curious about the deluxe edition, we also know one of the two bonus tracks. If you saw Bruce on either the Magic or WOAD tour, you heard him play "American Land" during the encore. If you bought the deluxe edition of The Seeger Sessions, you own a version of "American Land." If you buy the deluxe Wrecking Ball :: wait for it :: you'll get a recording of "American Land." Speaking of Working On A Dream, we can all thank our stars that its producer Brendan O'Brien has been benched in place of Springsteen, longtime manager Jon Landau, and Ron Aniello. O'Brien has been behind the boards of some good records, just not for Bruce. Okay, that's not entirely true. Magic is an outstanding record... in spite of O'Brien's awful, ruinous, production. No matter, out with him and in with Bruce and Aniello with Landau serving as exec. producer. The absence of O'Brien is good, but there are two other absences on this record that should be mentioned and there is no rejoicing here. First off, we don't wish O'Brien dead, merely away from Bruce's music. That should be said upfront because the two men we're talking about now are Danny Federici and Clarence "Big Man" Clemons. Both men were part of the E Street Band from its earliest days and both passed away in the past few years, Clemons passing just last year following a stroke. Federici died before WOAD was released but work he'd done still appeared on the record. We don't know for a fact that's not the case on WB but there's a very good chance they didn't. European dates for the WB tour have been announced and US dates are expected shortly. Stay tuned, kids. Springsteen is back and we'll be following him as close as our allowance will allow.